The Progress-Focused Approach: How solution-focused is the SMART approach? Nick Bernett wrote me an e-mail saying he doubts whether the SMART approach to goal setting fits with the solution-focused approach and he asked me what I think about this. Here are my thoughts. What is SMART? In case you haven't heard about SMART, here is a brief explanation about what it is. SMART is an acronym which stands for Specific, Measurable, Attainable, Realistic, Time-bound. Over time, quite a few alternative words have been suggested for these letters and also a few extensions of the acronym with a few letters but for our discussion let's keep things simple here and stick to the original (as far as I know) and simple form. SMART as a tool probably emerged from the management by objectives (MBO) approach which emphasized the importance a process of defining objectives within an organization so that management and employees agree to the objectives and understand what they need to do in the organization. SMART is often seen as a handy tool to help managers and employees to agree on effective goals. 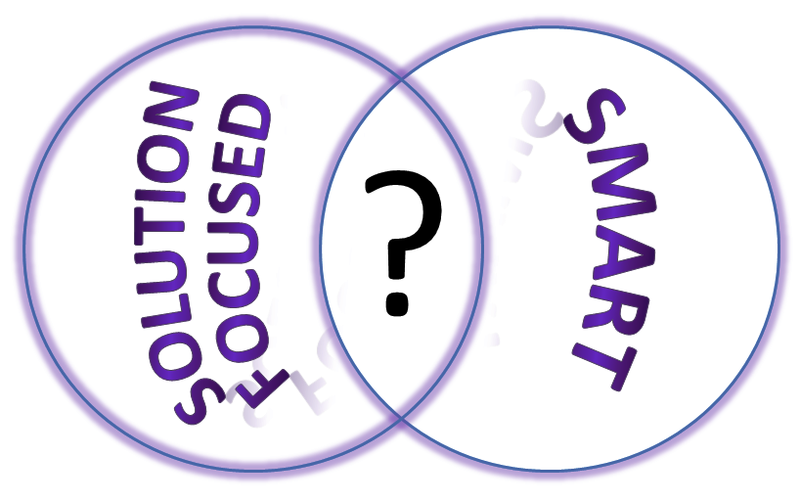 Some overlap between SMART and the solution-focused approach. At first sight, SMART does appear to have some commonalities with the solution-focused approach. Pioneers of the solution-focused approach did indeed describe the solution-focused approach as a goal directed approach (de Shazer, 1988) and recommended setting well defined goals (Walter and Peller, 1992) which should be: 1) in a positive representation, 2) in a process form, 3) in the here and now - which means the client can start the solution immediately, 4) as specific as possible, 5) within the client's control, and 6) in the client's language. Both these solution-focused pioneers and the SMART approach emphasize the need for specificity. Also there appears to be some overlap between Attainable and Realistic on the one hand and within the client's control and in the client's language on the other hand. Solution-focused goals are dynamic rather than static: Instead of choosing a goal at the beginning of the solution-focused process which is then left unchanged, in the solution-focused approach the 'goal' (which is usually referred to as preferred future or desired situation) is not seen as something static which can be pinned down in advance precisely. Rather, the desired situation is continuously developed, refined and changed as the process proceeds. The solution-focused approach is a test-learn approach, rather than a plan and implement approach. It can be thought of as a circular process in which iterative rounds of action and reflection lead to updating goals and possibilities. The 'end goal' will be continually developing and perhaps even changing a lot as we go along. The process is open ended and evolving from moment to moment. Differences in motivational approaches. Perhaps a slightly more subtle difference between how the two approaches are used in practice has to do with the differences assumptions behind the two approaches. While I'd like to acknowledge that the rather laudable aim of the management by objectives movement originally was to help managers reach agreement with employees on specific goals with employees, my perception is that SMART is usually used differently, nowadays. My perception is that it is often used as a motivational tool. A common assumption among managers (and management trainers) appears to be that if you don't make goals SMART for employees they won't try to achieve them. In addition to this, it has become common management practice to tie employee appraisals and bonuses to the achievement of SMART objectives. By using SMART is this way, it has become a tool for exercising management control and extrinsic motivation. This way of using SMART is at odds with the solution-focused approach which explicitly aims to support human autonomy and which tries to avoid exercising control and extrinsic measures as much as possible. Thanks Coert for yet another thought provoking and relevant post. I've been struggling with this question regularly as SMART often seems to be the instrument of choice for decision makers and review boards and therefore cannot always be avoided. I'm finding that I tend to treat goals that are defined along those lines as external goals which can then serve as the outline for developing more solution focused goals and plans of action with the team involved. Like you stated, this can lead to the need to update a goal and the actions can develop in a different direction. I have found though that because you can very clearly explain why a different approach is chosen and what the effect has been, this if often acceptable. I've also found that it leads to decision makers being more interested in goals developed and defined by the people who do the actual work. It becomes clear to them that the goals of the people in the field are sometimes even more ambitious than their own and more attainable this way. At least in the field of community care and welfare it seems that of late governmental bodies look more closely at successful approaches and goals that are developed in the field. "Practice based evidence" is becoming more popular, and in my mind that goes quite well with the solution focused approach. But that could be worth a whole new discussion! Interesting point: "the goals of the people in the field are sometimes even more ambitious than their own and more attainable this way". I think that's true. My experience is that one reason which sometimes relaxes managers a bit in their tendency to use static SMART goals is their acknowledgement of the unpredictability and dynamism in their work context. This calls for a more dynamic approach and for responsiveness to unpredicted events. Interesting debate! For me, I like to integrate the best of both and I think this create more value. In my experience SMART (when stated in a positive way, so not in negative or avoiding ways, like "we don't want to..." or " let's try to prevent...") is very helpful to create a future (a bit more realistic) perfect. Also to bring some high in the sky futures a bit more to earth. This gives a beautiful combination of dreams and little steps. Thanks Coert for the insights in raising this point. There's sometimes a tendency to view other non-SF management and change models as competitive threat to our work with clients. When a client asks me to use SMART, SWOT, etc., I skip the downside discussion and instead apply SF to the application. My line is usually, ‘SWOT is helpful and it only takes you so far. We can make it even more effective if we layer in SF’ Followed by, ‘When you used SWOT last time, what worked?’ They don’t always have a long answer because they don’t realize that they use it as an extension of problem focus, i.e., loads more threats and weaknesses than strengths and opportunities. At the work session under the SWOT’s weaknesses section I ask the client what it will be like when the weaknesses are no longer an issue. Quite often, because they have already built their thinking on the strengths and opportunities section they say things like, 'the weaknesses will no longer matter’. I’ll have to try SMART again sometime soon.